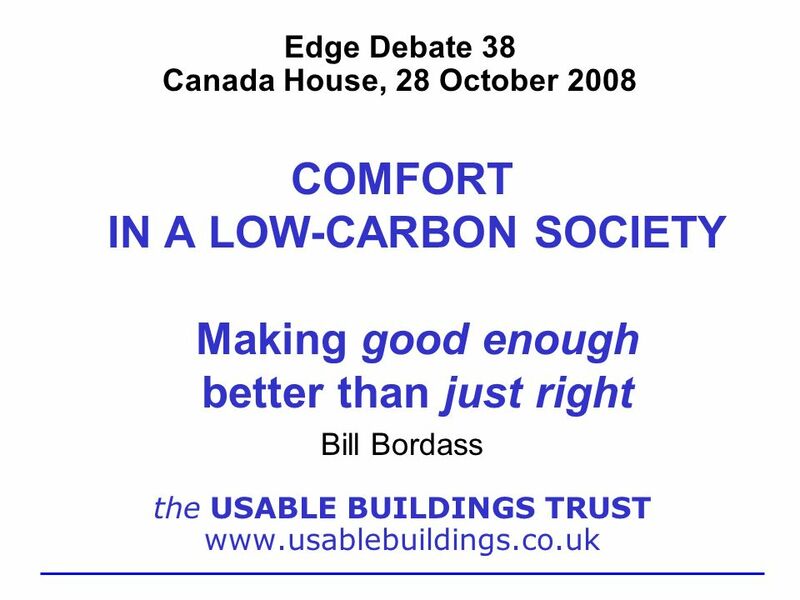 Edge Debate 38 Canada House, 28 October 2008 COMFORT IN A LOW-CARBON SOCIETY Making good enough better than just right Bill Bordass the USABLE BUILDINGS. 2 What we ve got used to, we re not entitled to … R BUNN Evening out fluctuations has become an egalitarian enterprise which it is heresy to question. MICHAEL YOUNG, The Metronomic Society (1988). Always on 365/24/7. Providing comfort to defined standards. Enhancing productivity. There is something inelegant in the mass of energy-consuming machinery needed at present to maintain constant RH … something inappropriate in an expense which is beyond most of the world's museums. 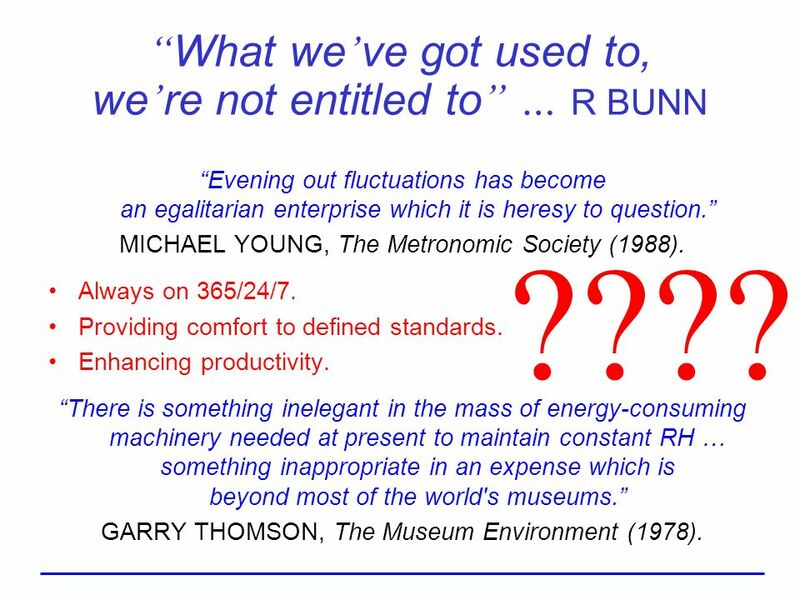 GARRY THOMSON, The Museum Environment (1978). ???? 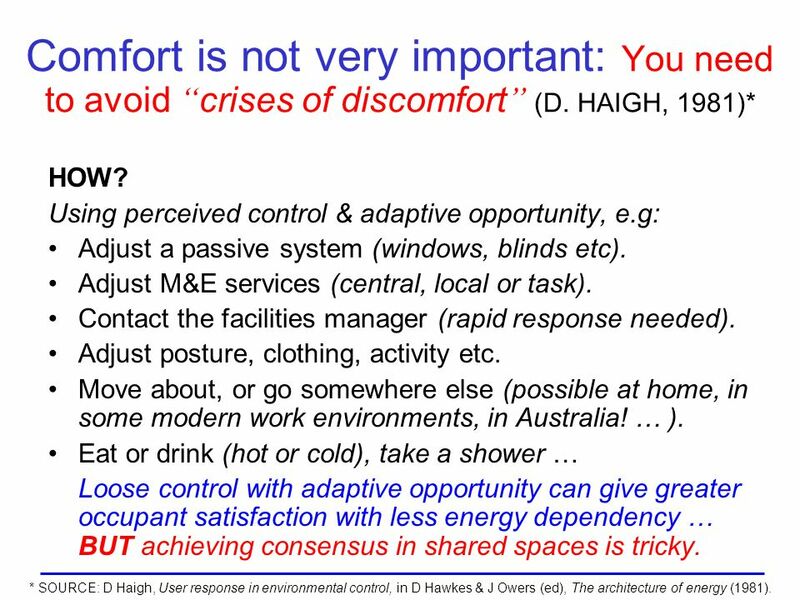 4 Comfort is not very important: You need to avoid crises of discomfort (D. HAIGH, 1981)* HOW? 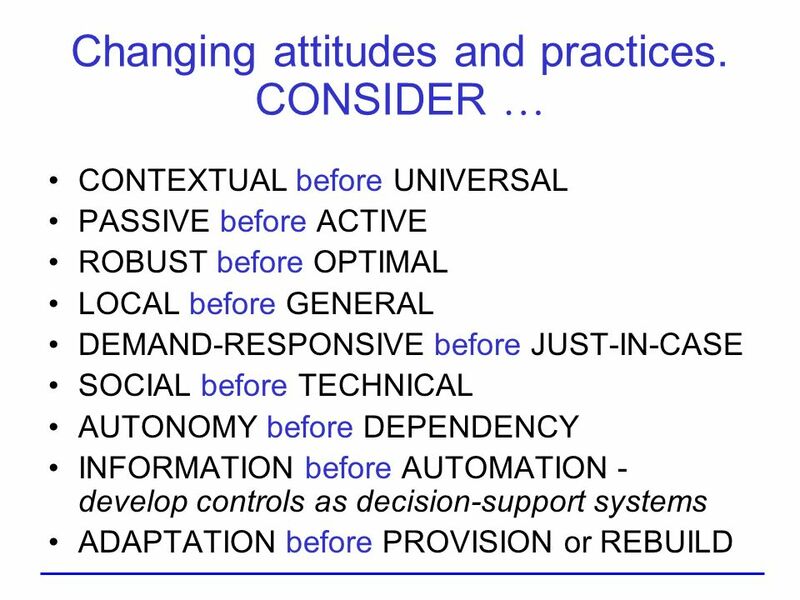 Using perceived control & adaptive opportunity, e.g: Adjust a passive system (windows, blinds etc). Adjust M&E services (central, local or task). Contact the facilities manager (rapid response needed). Adjust posture, clothing, activity etc. Move about, or go somewhere else (possible at home, in some modern work environments, in Australia! … ). 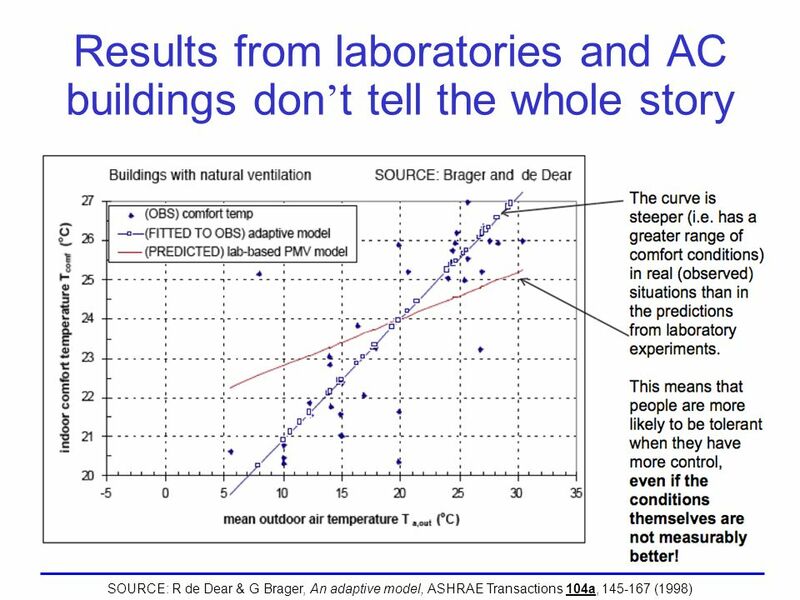 Eat or drink (hot or cold), take a shower … Loose control with adaptive opportunity can give greater occupant satisfaction with less energy dependency … BUT achieving consensus in shared spaces is tricky. 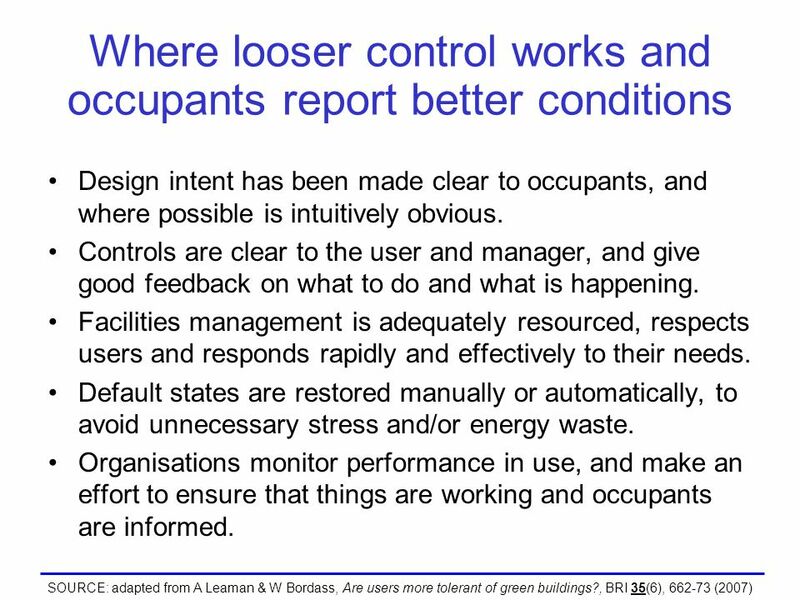 * SOURCE: D Haigh, User response in environmental control, in D Hawkes & J Owers (ed), The architecture of energy (1981). 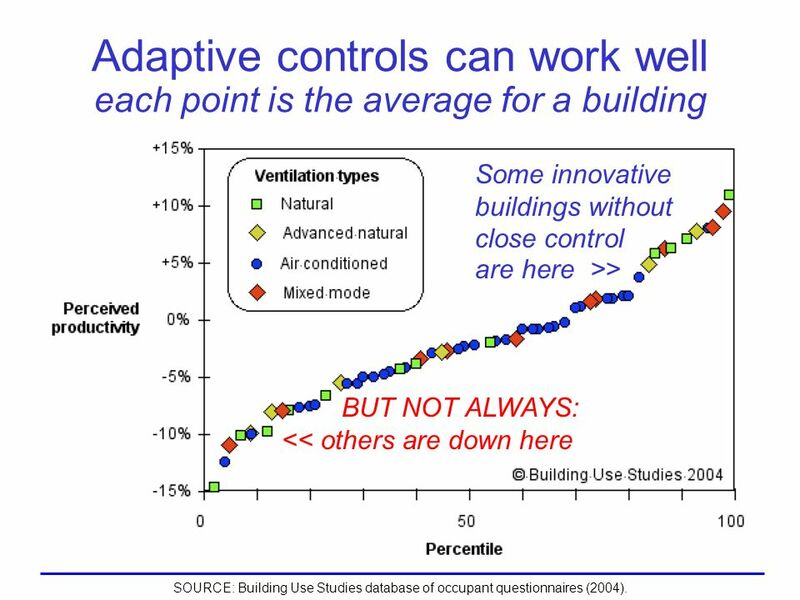 6 Adaptive controls can work well each point is the average for a building Some innovative buildings without close control are here >> BUT NOT ALWAYS: << others are down here SOURCE: Building Use Studies database of occupant questionnaires (2004). 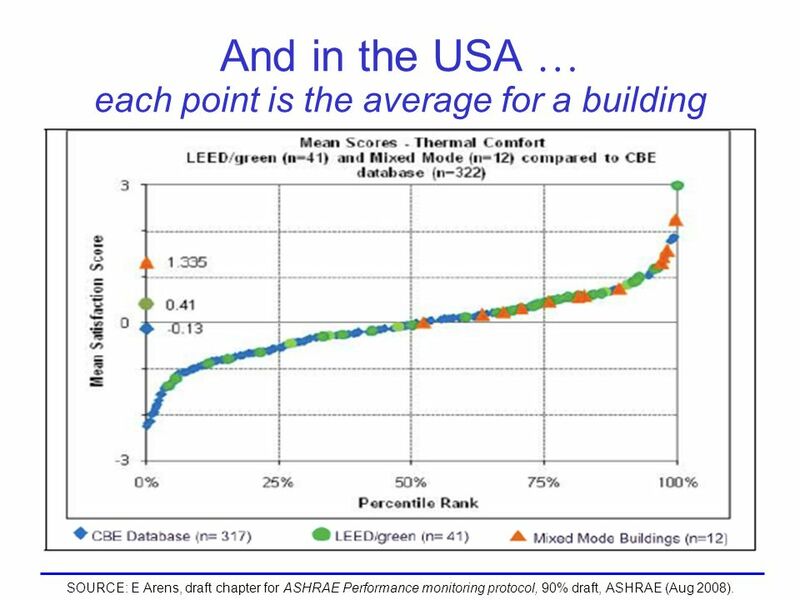 7 And in the USA … each point is the average for a building SOURCE: E Arens, draft chapter for ASHRAE Performance monitoring protocol, 90% draft, ASHRAE (Aug 2008). 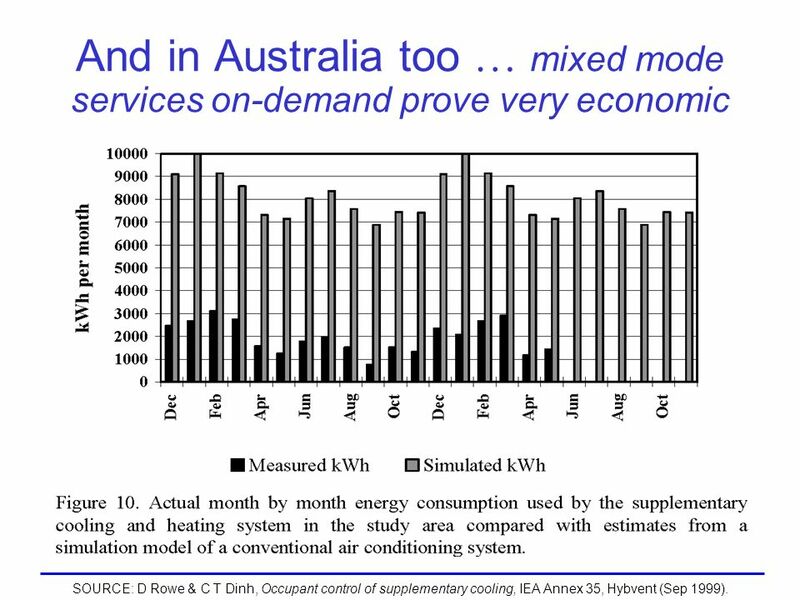 8 And in Australia too … mixed mode services on-demand prove very economic SOURCE: D Rowe & C T Dinh, Occupant control of supplementary cooling, IEA Annex 35, Hybvent (Sep 1999). 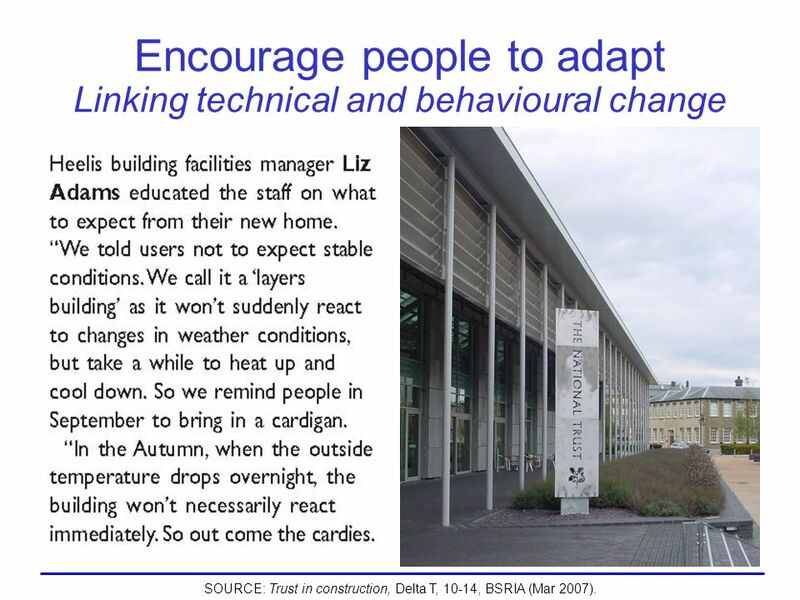 10 Encourage people to adapt Linking technical and behavioural change SOURCE: Trust in construction, Delta T, 10-14, BSRIA (Mar 2007). 12 A low-carbon society: Learning to live within our means Take account of the context, the clock and the seasons. Use passive systems where possible. Match any energy use to supply availability. Consider on-demand energy systems (in space as well as time), not blanket provision. As a general rule, the less highly-processed the internal environment the better. 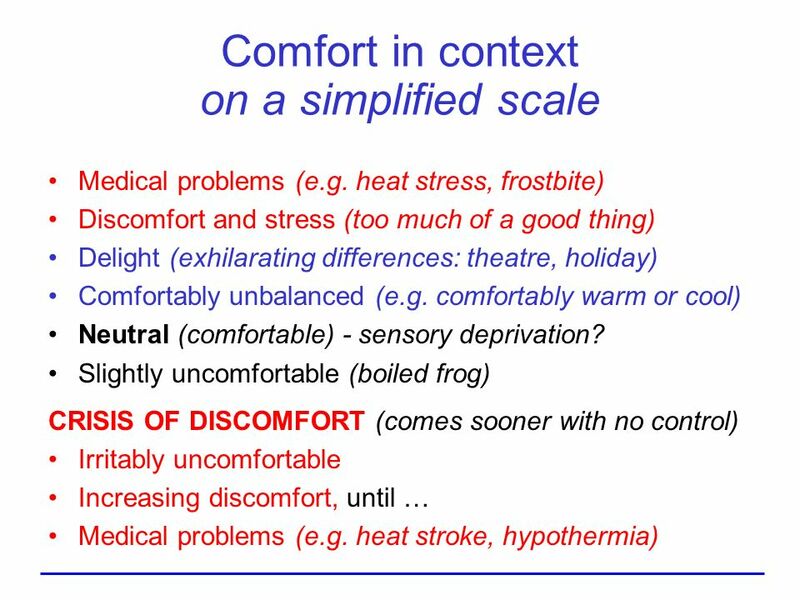 COMFORT IS NEGOTIABLE: Get away from dangerous prescriptive or performance- based comfort standards, especially international ones! 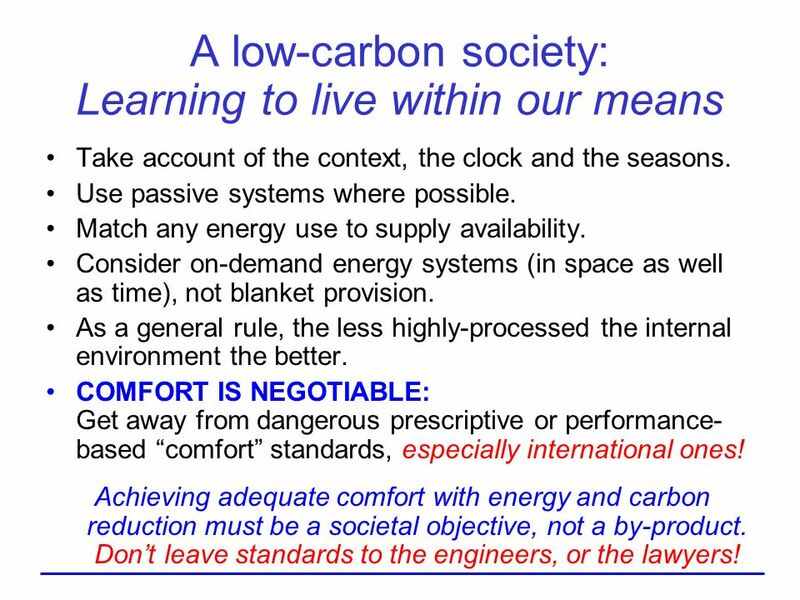 Achieving adequate comfort with energy and carbon reduction must be a societal objective, not a by-product. Dont leave standards to the engineers, or the lawyers! 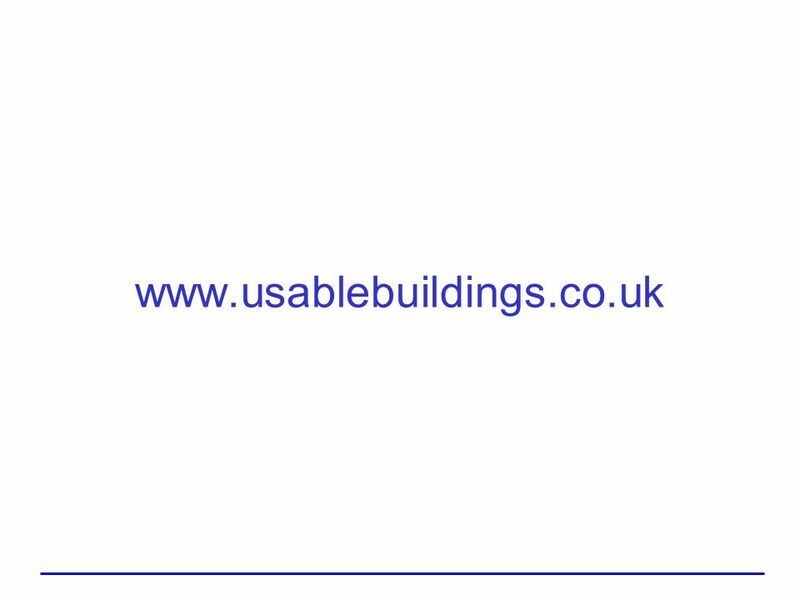 Download ppt "Edge Debate 38 Canada House, 28 October 2008 COMFORT IN A LOW-CARBON SOCIETY Making good enough better than just right Bill Bordass the USABLE BUILDINGS." 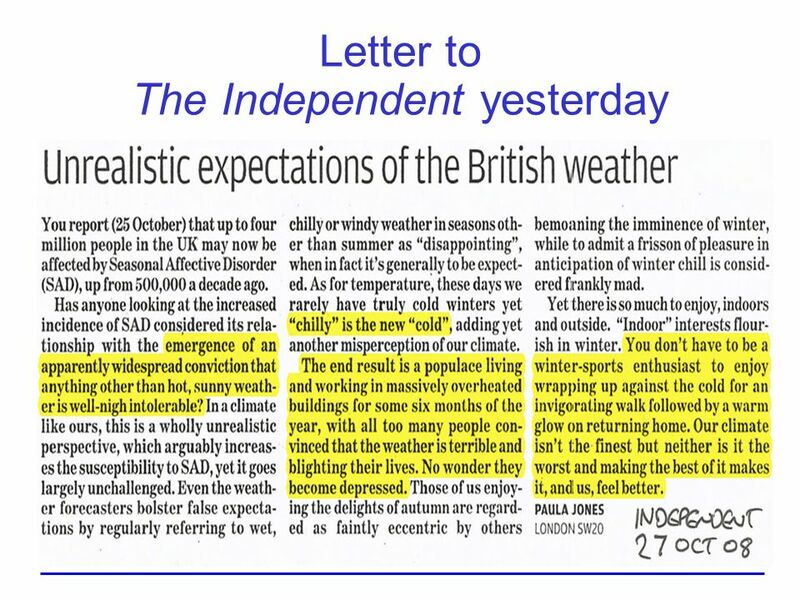 Future Comforts: Policy Studies Institute Do you want to control the Temperature? Max Fordham. 1 Hot & Cold Weather Injuries and Emergencies Authored by John W. Desmarais 18-May-1999 Updated by 09-Jul-2008 Modified by Lt Colonel Fred Blundell TX-129th. _____________________________________________ Climate Challenge Fund What type of project would help your community? February 2013. Song by Sean Morey Ladies and Gentleman the Man Song. CIC, 16 September 2010 Rethinking Professional Services for the Low Carbon Future A NEW PROFESSIONALISM that engages with outcomes Bill Bordass the USABLE. Exploring students’ group work needs in the context of internationalisation using a creative visual method A.M. Cox Information School, University of Sheffield. Innovative Solutions to Improve Comfort & Efficiency NEX and PLAY. Action – Doing vs Being S.East Asia Middle East Latin America Africa E. Asia E. Europe Israel E. Asia USA Canada. Cold-Related Emergencies: Key Points O Environment does not have to be extremely cold for a person to suffer a cold-related emergency, especially if the. Efficiency of form and system – architectural requirements in the age of ecology Michael Haslam Dublin School of Architecture Orna Hanley + tbc 15 th February. A Social Practice Perspective The work of the SPRG offers a distinctive perspective for understanding, explaining and addressing consumption and everyday. DESIGNING FOR COMFORT Richard B. Hayter, Ph.D., P.E. Kansas State University Manhattan, KS, USA. Ball State Architecture | ENVIRONMENTAL SYSTEMS 1 | Grondzik 1 THERMAL COMFORT. 1HEAT&COLD..PPT LAST REVISED: 9 JULY 2008 Citizens Serving Communities Hot & Cold Weather Injuries & Emergencies Developed as part of the National Emergency. Heat and TemperatureSection 1 SPS7.c Determine the heat capacity of a substance using mass, specific heat, and temperature.